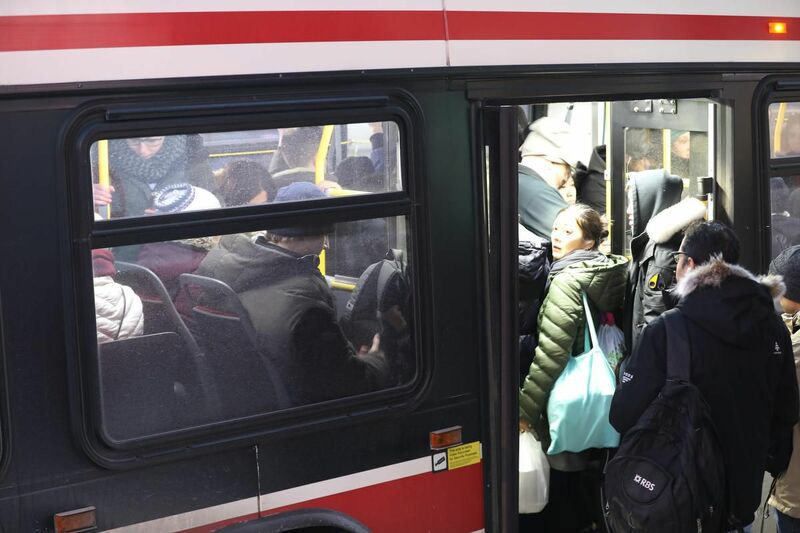 There are two ways to think about the Toronto Transit Commission’s proposal to increase fares this year. You can look at it, as the cliché goes, from inside the box. Or you can consider it outside the conventional boundaries of transit planning and political thinking. From an inside-the-box point of view, the proposed increase of 3 per cent, which would add 10 cents to the price of Presto fares and raise the cost of a regular monthly pass, is pretty reasonable. After all, goes the argument, fares were frozen last year. And at the same time the city has been investing in the TTC — raising its contribution to the system’s budget by 32 per cent over the past four years, as Mayor John Tory points out. It’s added bus routes and introduced the two-hour “hop-on, hop-off” transfer, which just by itself will cost $20 million this year. And to ease the pressure on lower income users, it brought in the Fair Fare Pass program that significantly lowers the price of a monthly pass for people on social assistance. Someone has to pay for all this good stuff, so maybe an extra dime a trip isn’t too much to ask. That makes sense, as long as you stay huddled well inside that transit box. Peek outside, though, and the problems with continuing to raise transit fares become obvious. The question isn’t whether the TTC needs more money every year just to maintain service levels where they are, let alone improve them (and leaving aside the massive investments needed to build for the future). The question is who should pay — the people who use the system or taxpayers in general. Collectively, through the politicians we elect to make these decisions, we’ve answered that question pretty decisively. Compared to other big cities, we expect users to carry most of the load. And raising fares (nearly) every year continues that pattern. This is all well-documented. Last November, for example, the transit advocacy group CodeRedTO released a report comparing how Toronto pays for transit compared to seven other metro areas: Montreal, Vancouver and five big U.S. cities. In fact, fare revenue accounts for less than half the budget in other cities, with governments (i.e. taxpayers) making up the rest. At the same time, the TTC’s per-ride subsidy was only 90 cents in 2017, far lower than in other comparable cities. This puts a squeeze on services and forces the TTC to keep raising fares to balance its operating budget. It keeps fares (especially monthly passes) expensive and discourages people from using the system. Imagine another world, one where governments appreciated the value of excellent public transit and increased the TTC’s subsidy to the level of say, Los Angeles or Vancouver. Instead of adding a dime a year to the price of a trip, the TTC might freeze it for the long term — or even actually cut it a bit each budget cycle. Added up over a few years, that could be a game-changer for transit use; it would incent a lot of people to get out of their cars, with a host of obvious benefits. Of course, there’s no point trying to cram a lot more users into an already over-loaded system. We still need to make massive investments in the TTC, and just how massive also became clearer last week. The agency has calculated it will need a staggering $33 billion over the next decade and a half to keep the system operating and deal with anticipated growth in ridership. And that doesn’t even include the cost of building new transit lines. It’s a huge undertaking, and it should give the Ford government pause as it forges ahead with “uploading” Toronto’s subway system to the province. It may well be taking on a much bigger commitment than it had bargained for. A more constructive approach would involve working with the city to make the system better for everyone. And that could start with breaking the cycle of sticking TTC users with more of the cost each year.